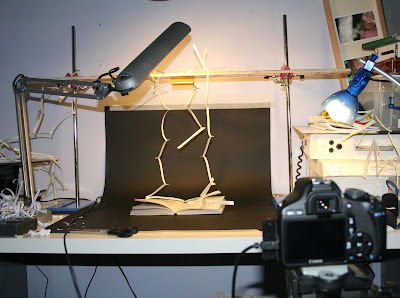 Here's a little glimpse into my home studio set-up for some small scale stop-motion animation work. I'm using the Canon 550d here with Stop Motion Pro; finally a good live view-capable system is in my grasp :) This shoot is lots of quite simple things, small models made from paper etc. I bought a couple of laboratory-style retort stands yesterday. These have a certain nerd-appeal but are also damn handy as desktop stands, small and versatile and ideal for this mini stop-mo work. Maybe I'll post a bit more about this work once it's done.